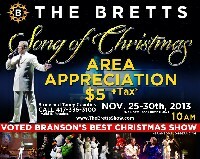 THE BRETTS SONG OF CHRISTMAS SHOW AREA APPRECIATION – November 25-30 (No show Thanksgiving day). $5 plus tax and fees for residents and employees of Stone and Taney county. With proof of residency or employment. Subject to availability. Call 417-336-3100 to reserve your tickets today! The Bretts SONG OF CHRISTMAS Show Description – Bring in the holidays with America’s favorite Christmas show, featuring traditional favorites, heartwarming holiday fun, and The Bretts widely acclaimed Christmas patriotic tribute, “I’ll Be Home for Christmas.” If you listen to all kinds of music and enjoy the Christmas season, then you will love The Bretts SONG OF CHRISTMAS Show in Branson (Voted Branson’s Best Christmas Show by BransonBloggers.com). This is such phenomenal entertainment; you cannot afford to miss it!